My sister wanted to experience a B.C. ski hill during her trip so I took her for a two-day trip to Big White. Amazingly, the day we were there was when 13 cm of fresh powder fell on the mountain (!!) and I was beside myself. I had never gone cross country skiing before so we decided to give that a try in the morning. Besides waiting 20 minutes for my sister to actually put her boots into the skis (gah), it was quite a pleasant trip to pave our way into the fresh snow. I hadn't known there were all these cross country trails at the base of Big White. It was a beautiful day with just the right amount of wind and sun and I worked up quite a sweat! Maybe I'm used to boarding but I had quite a difficult time with the cross country skis. I couldn't get a good groove going until later that day and (to my surprise) my sister beat me the entire way through. That was embarrassing. 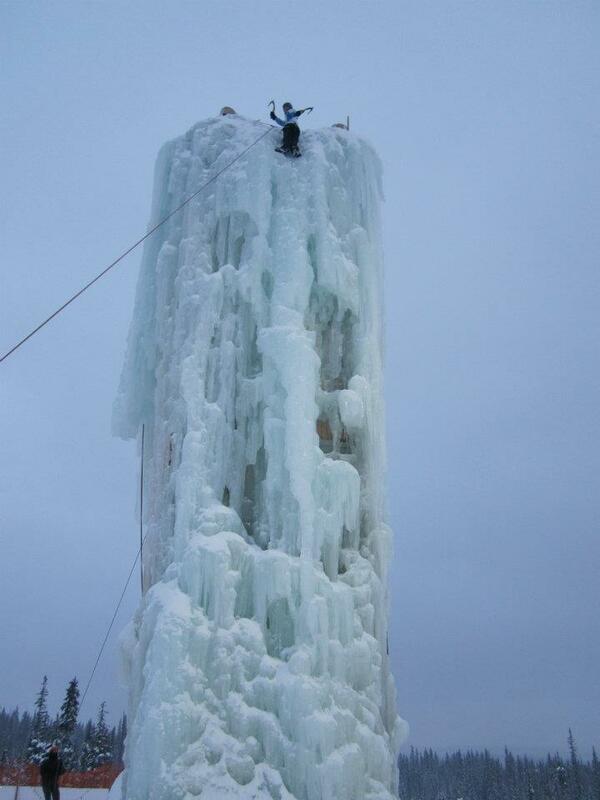 Later that day, we decided we wanted to tackle the 60 foot ice climbing tower. It was essentially a giant slab of ice. I think I went first and I was a little nervous because I had never really climbed before, let alone climbed on ice. I got these huge ice picks and I guess the main thing in ice climbing is trusting your ice pick. 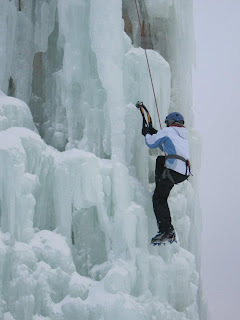 Apparently it could catch onto any bit of ice but it's whether you trust it to hold you and stay there that will determine if you can pick your way to the top. It sounds weird because I would rather know that my ice pick is deep into the ice than just trust that it is but whatever, it seemed to work. It was pretty grueling because there was a lot of arm strength needed and I had to maneuver my way around icicles and up and around random juts of ice but after about 15 minutes, I made my way to the top! Best of all, there was a cow bell at the top that I got to ring! Also, what could possibly be more beautiful than a super colourful sunset seen from the ski hills? I think it's pretty obvious I like to eat. I love to eat. I love to cook. I love everything about food. When my sister came to visit me, we started our trip off in Vancouver. I had been to Vancouver a couple times already and not to say I've seen everything, but I really just wanted to eat while I was there. Kelowna isn't a bustling food city so I needed to take advantage and boy did we. The Eatery is a Japanese sushi pub near UBC. It's clearly a student place but the sushi rolls were so much fun! They had sweet names and were pretty creative. Yum! I know it's not natural sushi by any means but it was so good! We were perhaps super hungry by this point but they were still really tasty. What are the chances we get off the bus and see La Taquiera? It was on my list of restaurants to try in Vancouver. They had a list of tacos on their blackboard and they had specials on the side. While the specials looked good, I couldn't resist the ones on the blackboard. I believe we had fish tacos and then I had a beef cheek taco and one with beef in a chocolate mole sauce. So yummy! Muira Waffle House sells savoury and seet (wait for it) waffle sandwiches! We got a traditional breakfast sandwich with eggs and ham but their Asian inspired waffle sandwiches are so much better! This is a bulgogi waffle sandwich. Not only is there bulgogi in between the waffles, there is bulgogi IN the waffle! The savoury balanced out the sweetness of the waffle. I would kill to have another one! Afghan Horseman was supposedly the first Afghani restaurant in all of Canada. The restaurant was fairly small but was pretty packed while we were there. I got this awesome dish with lamb and curried cauliflower, spinach, potatoes and this sweet rice that had carrots and raisins on top. It was very flavourful and very colourful and so good! This was our appetizer at the Afghan Horsemen. It was similar to a Chinese onion pancake but substitute potato inside and then add a yogurt on top. Pretty yummy. Grounds for Coffee is a cafe close to UBC. They have these super gooey and chewy cinnamon buns. My cinnamon bun was a little too cinnamon-y while my sister's was not cinnamon-y enough, however I still give them major props for making cinnamon buns with a crisp exterior. Usually I find cinnamon buns too soft but this one had character! I had been forewarned Calgary is freaking cold! But fortunately for me, there was a chinook while we were there so I didn't face -40C temps, it was more like 0C. Yeah for me! My second day there kicked off with lots of walking around. I think after Kelowna, I was just stoked to be back in a city with actual skyscrapers, with busy roads, with a public transportation, etc. I loved being able to walk everywhere and take the bus or the C-train to get around. I think I just miss proper city life sometimes. That's besides the point right now however! I went to Stephen Avenue Walk, which is supposed to be the historic part of Calgary. I suppose historic really just means some cobblestones and old-ish looking buildings. But the reality is this was where the shopping was. My friend I walked into what we thought was one store but lo and behold! Calgary is connected by a tunnel system because sometimes it does get that cold where you don't want to go outside and be exposed to the elements. And what do they line these tunnels with? Shops. Thank you Calgary! The Chinook Centre - ah-mah-zing mall! I didn't have much time here but oh if I did, I would give that 5% HST a run for its money. The Stampede! Hopefully I'll get a chance to go this year. Inglewood - When I first heard about Inglewood, I couldn't help but think about LA's Inglewood...which you don't really go to if you don't have to. But this Inglewood is more about antique shops and boho stores. Wait, you don't have dinosaur skeletons at your mall? Weird. It's funny what can happen when you miss a turn. A few weeks back, I had to head down to Osoyoos for a structure fire. Osoyoos is a small town near the US border and I had been maybe one other time but I wasn't too familiar with it. My cameraman and I were driving on the main highway (there really is only one main highway in this part of BC) and we were looking for 12th Street. I was looking around for it but then it suddenly came up and we missed it. Not a big deal right? We figured we would just take the next turn and head back. But lo and behold! Who figured the next turn would be the border crossing?! A couple years ago, I learned about a program called Santa to a Senior. The program gives Christmas presents to seniors who live alone and who may not have family around. It pretty much broke my heart to think about seniors sitting by themselves on Christmas Day without anything special to mark the holiday season. The program puts the request of seniors on these little tags and then the tags decorate special Christmas trees that are set up in partnering retail shops. The tags read simple items like scarves, chocolates and ornaments. As soon as I found out Kelowna had a program, I wanted to get involved. And you know what? It was probably the most fun I had buying presents. I had a blast going around shopping for the seniors and getting them the best of the simple things like razors and pens. I decided I wasn't going to skimp out on these seniors, no they were going to get the best or most special looking presents. Later I got to do a story with one of the partnering agencies, Meal on Wheels, as they handed out the presents to the seniors. Omigosh, I melted. One man was just so enthusiastic and was grinning ear to ear when the volunteer gave him his present. They're just so grateful to know that somebody cares, that somebody was willing to take the time to make sure they felt special on Christmas. I think the story turned out well and I can only hope it encourages other people to get involved in not only programs like this one but other programs that help the vulnerable and disadvantaged.